PCs don’t have to be power hogs, but they often are. High-powered desktops with gaming-focused dedicated graphics hardware are the most thirsty for energy, but older PCs are typically less energy-efficient than modern ones. This is a particular concern if you want to repurpose an old PC as a media center PC or home server. Depending on the price of electricity in your area, you might actually save money by buying modern, low-power-usage hardware and retiring that old hardware. Don’t Use Screensavers; Just Have Your Display Power Off: Screensavers just aren’t helpful anymore. Rather than having your PC start playing a screensaver and keep its monitor on, have it automatically put the monitor into suspend mode when you’re not using it. You can still move the mouse cursor 0r touch the keyboard and immediately get back to the desktop, but the display will use almost no power in this state. Use Sleep and Hibernate: You shouldn’t just leave your computer on all the time. But you don’t have to shut it down when you step away and boot it back up and launch your applications when you need to use it again. Instead, just have your computer sleep or hibernate when you’re not using it. You can have your computer sleep or hibernate instead of shut down from the Start menu, or tell your computer to automatically sleep when you’re not using it. In sleep mode, your computer will use almost no power, and can return to your desktop with all your open programs in a second or two. In hibernation mode, your computer will use absolutely no power, but it’ll take a bit longer to get back to the desktop. Either way, you won’t lose any of your work, and you won’t have to leave your computer on. If you’re in the habit of leaving your computer on to perform a long-running task like a download, use software that can intelligently manage this. For example, BitTorrent clients and other file-downloading applications often have a button you can click to automatically suspend or hibernate your computer after a download finishes. Upgrade to an SSD: If your computer still uses an older mechanical hard drive, that drive is both slower and uses much more power than a modern, faster solid-state drive. Consider upgrading your computer to a solid-state drive to cut down on its power usage and dramatically increase overall system performance. Other Tips: All the standard tips for increasing a laptop’s battery life apply here, too. 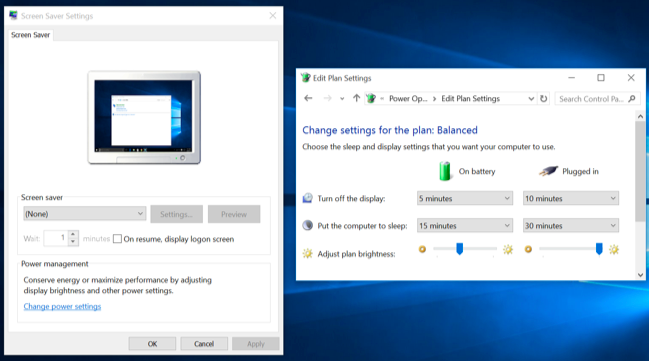 But you won’t typically want to micromanage all these settings on a desktop PC as you would to stretch the battery life on a laptop. Windows already does a lot of this on its own, automatically throttling your CPU to keep it at the slowest speed possible while idle and performing other power-saving tweaks, including having your computer’s hard drives sleep while idle. 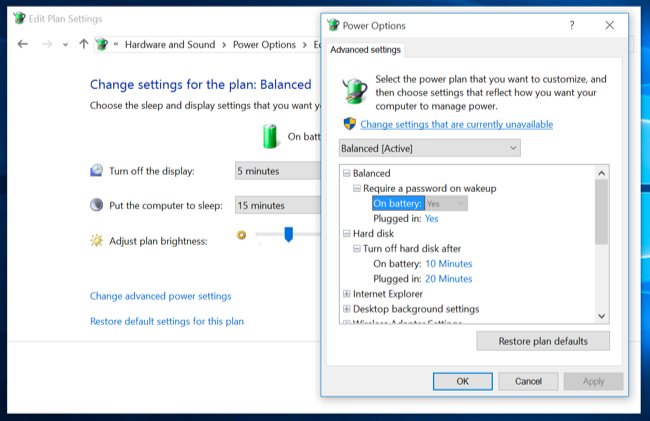 You can modify your power plan and power-saving settings from the Power Options control panel in Windows. You could also unplug peripherals you don’t use much — for example, if you have a printer plugged in but use it only rarely, leave it unplugged and powered off until you need to use it. There’s really no way around it. If you want a really low-power-usage desktop PC — perhaps you want to use it as a lightweight desktop PC, home server, or media center system — you’ll want to seek out low-power-usage hardware. Most modern hardware has thankfully become more power-efficient — with the possible exception of high-end graphics hardware. Modern CPUs can throttle themselves and use less power at idle, solid-state drives are more power efficient than magnetic drives with spinning platters, and so on. Avoid the high-end, high-power hardware if you’re doing this. You definitely don’t want an energy-guzzling high-end graphics card from NVIDIA or AMD. Onboard, integrated graphics are the way to go and will offer dramatic power savings. Even if you aren’t doing anything demanding, those dedicated graphics cards often use quite a bit of power just at idle, much more than integrated graphics would use. 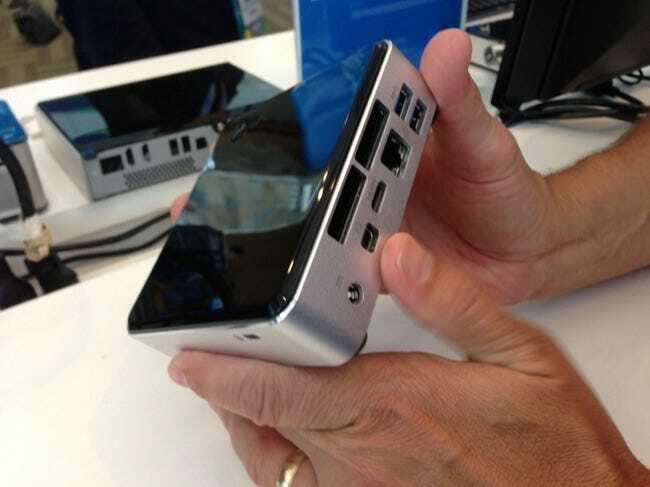 Look for “low-wattage” and “low-power” components or prebuilt PCs, which will probably come in small form factors — a PC that fits into a tiny box or even an HDMI-stick PC that fits into the palm of your hand. If you’re wondering just how much power your current hardware uses, you can get an energy-monitoring device like the Kill-a-Watt and use it to check how much power your current hardware is using and compare it to how much power new hardware will use. Check the cost of electricity in your area and you’ll see how much money you could save by switching. You might even consider a Raspberry Pi to power a lightweight media center or server. These ARM-based systems aren’t as powerful, but they’re inexpensive, customizable, and use a very small amount of power.